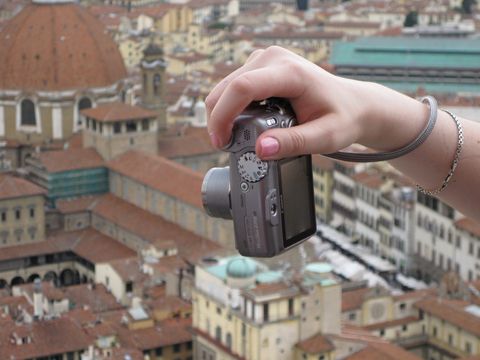 This Study Abroad course introduces students to the unique demands of travel photography and shooting on locations. While living and studying abroad, students detail their experiences through photographs, considering various techniques for shooting in crowds, from a distance, and in low-light conditions without a flash, among others. Expressive use of color and composition, as well as narrative concepts, will also be discussed. Prerequisites: none. Identify cross-cultural issues, ideologies, perspectives, and the contributions that people of diverse backgrounds bring to an interdependent and multicultural world. Incorporate world cultures and global perspectives into a universal (catholic) worldview. The difference between Study Abroad and Vacation - required documents - currency exchange - language considerations - what to expect (and not expect) living in another country. Reading: After the Florence Flood: Saving Vasari's "Last Supper"
On location - reacting to what’s around you - working with what you have - review of camera functions - keeping a visual record of your experiences - keeping a written record of your experiences - combing the visual and the written. Project: photograph people around campus, considering how they define your university experience; write a statement about your project. Student Presentation: What do you want to do in Florence? Project: photograph a familiar place and a new place, conveying the essence of your (re)discovery; write a statement about your project. Student presentation on a restaurant in Florence. Student presentation on an area outside of Florence. Preparing images for printing – ink-jet media choices – book design. Preparing files for web delivery – social media – other methods of presentation. Checklist of essentials – what to pack and what not to pack. Projects 1 pt. 0.5 pt. 0.25 pt. Image is sharply focused, clearly emphasizing the subject. Image is softly focused, emphaszing the subject. Image is out of foucs. Image is properly exposed, with details in shadows and highlights. Image is under/over-exposed, with some loss of detail. Image is under/over-exposed, with loss of detail. Image is thoughtfully and creatively composed; follows project parameters. Image is thoughtfully composed with minimal distractions; somewhat follows project parameters. Image is carelessly composed; does not follow project parameters. Ingenuity Appropriate use of the features of Photoshop effectively communicates ideas. Somewhat appropriate use of the features of Photoshop, but lacks relevance to ideas. Indiscriminate use of the features of Photoshop. Accuracy Photoshop effects are meticulously applied, indistinguishable from the captured image. Photoshop effects are carefully, but not seamlessly, applied. Photoshop effects are carelessly applied.